Piggy swoons for her Kermie. The Florence Henderson episode of The Muppet Show features two key and related firsts for the series: (1) the first time that Frank Oz plays Miss Piggy for the entire half hour, never once trading off the part with Richard Hunt, and (2) the first time that an episode’s plot directly involves the guest star, not counting the Harvey Korman episode, whose “plot” was simply made up of two scenes in which he was dressed as a chicken, so I really don’t count it. 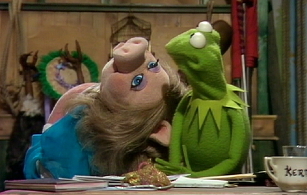 As plots go, this one isn’t much to write home about, either–Piggy catches Kermit “wooing” Florence Henderson and gets jealous–and would hardly have registered a blip on the radar later in the show, but this early, it is a significant development in the Kermit/Piggy romance saga, being the first time the main thrust of an episode focuses on their “relationship,” which is entirely one-sided at this point. We have seen brief flare-ups of jealousy from Piggy before this one, but this episode–and nearly every sketch appearance by Henderson–practically revolves around it. And it’s important that Frank Oz takes over Piggy for the entire time, because it is a major sign that she is evolving into the consistent character we know and love. Already, Oz’s Piggy has been established as the one who lusted after Kermit. Other than Hunt’s performance of Piggy singing “Temptation” in the Juliet Prowse episode, Oz always covered these moments, whereas Hunt generally only handled Piggy-being-haughty scenes. But since this episode is all about the former, that means that Oz had to steer the ship by himself. And although Hunt’s Piggy does appear again in later episodes, this is a turning point for the character and one that, in the long run, really establishes that Piggy should be Oz’s alone, because it’s the one where she comes together fully for the first time: her status as the show’s top diva, her adoration of the frog, which reaches fairy-tale-like heights of passion, her utter confidence in herself, her viewing any other woman getting near Kermit as a threat, her tough-as-nails attitude and temper juxtaposed with her more demure, ladylike qualities (at least in her own head). This is our Piggy. Florence Henderson in an unfortunate muumuu. 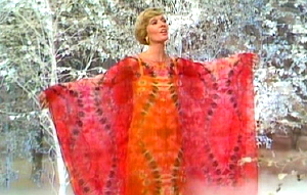 Meanwhile, although Henderson’s appearances are limited to on-stage songs and sketches, as most early guest stars were, she proves to be both a fantastic foil for Piggy and a sweet pal for Kermit, managing to play to the image most viewers had of her at the time as the kind, generous, “lovely” Carol Brady, while at the same time revealing a little bit of bite to confirm that she is not actually the woman who she’s best known for portraying on TV. Which makes her a fantastic Muppet Show guest, because we start out by getting what we expect from her only to then be surprised when her persona on the show rebels against her general public persona. Stars came to love visiting The Muppet Show because it gave them an opportunity to stretch outside the box that usually defined them, and Henderson seems to really relish being one of the first of the guests to get to do that. That isn’t to say that every moment given to her is perfect. Her opening song is one of those slow, early Muppet Show numbers in which no real Muppets–other than some very artful, abstract butterflies–appear. It seems like it could have come from any 1970s variety show, with painfully dated music and styles. The freeflowing orange tie-dye muumuu she’s wearing is alone an affront to fashion and eyesight, and while the butterflies are pretty to look at and an excellent example of some of the more realistic-looking puppetry the Jim Henson Company could produce (in terms of the butterflies’ naturalistic movements), most of the time you’re left wondering why they’re wasting so much of Henderson’s relatively limited time on The Muppet Show on her basically singing alone on a soundstage rather than playing with the Muppets. Later on, there’s also a debate sketch that is an unfortunately excellent example of the Jack-Burns-led Muppet Show‘s propensity for sacrificing character for humor. The topic of conversation, “Was Shakespeare, in fact, Bacon?” (meaning Francis) naturally provides an ideal jumping-off point for any number of pig/bacon puns and, at the start, the fact that Piggy and Henderson are at each other’s throats is entirely in character, particularly given the events of their previous scene together, which I’ll get to in a little bit. Florence Henderson is rude to the Guru. This is further underlined by the fact that Henderson is actually the first guest to not play a character in a debate scene. Instead, she’s playing “herself”–or at least herself as The Muppet Show has presented her up to this point–and it’s fun to see her getting a little nasty with Piggy. When Piggy mistakes Kermit’s referencing Francis Bacon as a dig against pigs, she asserts that it’s in bad taste to which Henderson gleefully responds, “Oh, no, bacon tastes real good. I had some this morning, and I really made a pig of myself!” Which is funny not only due to the puns but because it’s kind of amazing to see “Carol Brady” of all people baiting Piggy like this, and again, it’s due to what happened between them in their previous scene. However, it tips over into too far when Henderson then starts being nasty to some of the other Muppets. She makes an especially lame joke about there being “no question in [her] mind”…literally and laughs at it, amused at herself, at which point the Guru, sitting next to her, quotes a proverb from his country about people who laugh at their own jokes, to which she rudely responds, “That is the dumbest thing I’ve ever heard,” and continues to be confrontational throughout the rest of the scene, which makes no sense with how she behaves elsewhere in the episode. Being snarky with Piggy is a great sign of how the show is starting to weave plot lines throughout comedy sketches, but suddenly being awful to other Muppets as well makes no sense. In terms of the show adhering to internal continuity and character-building, it’s one step forwards, two steps back. However, at least from a pure performance standpoint, Henderson is wonderful in the scene and clearly had a ball getting to be mean on TV.